Unless you’ve been walking around with a paper bag over your head, you will know that it is the general election soon – and by soon, I mean tomorrow. The people I surround myself with have varying opinions on politics; some know the ins and outs of the differing parties, others are well into their 50s and have never touched a ballot paper. I’m not writing this post to tell you who to vote for because that is subjective. Instead, I want to encourage you and make an argument for why you should pop down to your local polling station and have your say on May 7th. Some people claim they do not vote because ‘they are all the same’, ‘they’ being politicians. It is easy to see why some think that this due to the world of politics creating a very ‘them and us’ mentality for the public, even just partly due to the prestigious education and salaries that most of us can only dream of. They are, however, not all the same. Some are from more humble backgrounds, some passionately want to make a difference to their consistency, some have wanted to be a successful politician their whole lives much like you have always had your career aspirations – but they all want your vote. Don’t let a small minority of criminals in the profession dictate your views because I’ve met a lot of passionate politicians who just want to represent your voice. This point also contrasts another common argument: ‘They will do what they want anyway’. This is a point admittedly not wholly untrue supported, in terms of our generation, by Nick Clegg’s promise to scrap tuition fees as party of his 2010 campaign and instead partaking in a coalition which tripled the cost of university for many. The way I look at it is that someone has to be voted into Downing Street; someone needs to politically lead this country. For you revolutionists out there – even Russell Brand, the self-titled revolutionist that he is – has buckled and called out for widespread Labour support. It’s a shame he couldn’t have seen sense prior to the closing of the voting sign up in April. Some feel that there is too much information to consume in order to make your decision on who to vote for. I can understand this – those manifestos are beastly documents. 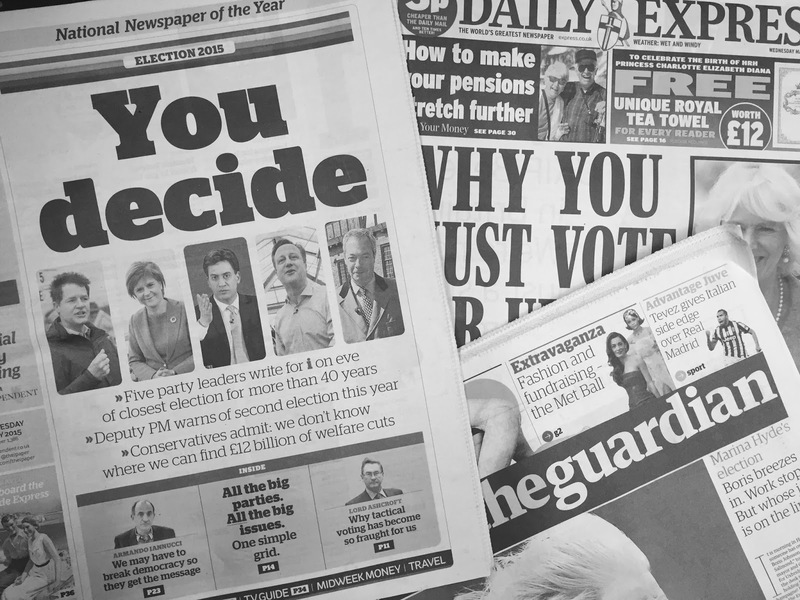 Essentially every news outlet is covering the election, providing you with the key policies put forward by each party. I would suggest reading around as, of course, newspapers have their own political agenda and there is even much debate over the impartiality of the BBC. Another point I hear a lot is ‘politics doesn’t affect me’. This is one that I could debate over for hours. If you care about how much you pay for a pint at the pub or how much money you take home in your pay slip every month or how long your mum is going to have to wait for that knee operation, you care about politics. Politics is woven into nearly every aspect of our every day lives, often without us realising it. A similar argument comes with ‘my single vote isn’t going to make any difference’. If every person who thought this actually voted, it would make a colossal difference to the outcome. In the 2010 general election, the turn out for voting in the UK was 65% – an increase on the previous two elections but still a significant drop from 1997 when the turn out was 71.4%. Think of 65% in the simplest of terms – 65 people out of 100, 130 out of 200, 260 out of 400, 520 out of 800. Is that really a fair representation of the country’s opinion? You have the civil liberty to have your say, a privilege that many countries do not permit. How you vote is up to you – you may be passionate about the deficit or international aid, or policies that personally effect you and your community may take priority. That is your decision to make. The importance of voting will effect your lives over the next five years; how far away does 2020 seem?! That’s when you will next have your say as to who sits on that front bench in parliament. We all make politics-based moans; how much train fare costs, how much tax we have to pay, how expensive housing is. This is your chance to have your say – VOTE!